At the time of writing, we offer just one Speaker Cable, Ringmat OFC Pure Power. RINGMAT OFC PURE POWER is a sizeable speaker cable with an outer diameter of 13mm. It is very flexible and the interior mould of the outer jacket hugs 4 substantial conductors in position around a central filler. Although the cable can be used to bi-wire to 2 pairs of terminals, it is designed for use as a single run cable from one pair of terminals to another pair, with the ‘opposite’ conductors paired. It also sounds very much better that way. The design of the cable is such that it has very low capacitance and very low resistance, resulting in exceptional tonal performance and a transparent and accurate sound reproduction. The sense of power and space is awesome, and yet resolution and fine nuances are exquisitely presented. Inside the cable jacket the ridges that hold the conductors in position are talc lined, enabling the cores to adjust position as the cable is wound and handled, avoiding permanent twists and knots. This also helps reduce vibration internally and further enhances the sound. Conductor sheaths are colour coded. Accordingly, cores north and south (blue) should be joined together as, say, positive, and cores east and west (black) joined together as, say, negative. The cable is directional. Normally, signal direction is the same as the print on the cable, but the manufacturers cannot warrant it. We shall check it out each time there is a production run. The Pure Power Speaker Cable is available either in 3m or 5m stereo pairs, terminated with various connectors (see below), or off the reel. On request, other lengths, terminated, are also available. See our price list. For some systems, it may be sufficient that the full 56 strands of the speaker cable are used, as provided when unterminated. When used in this manner, the cable has the additional merit of smoothing over deficiencies in many systems. However, when the number of strands has been reduced from 56 to 49, the clarity and other aspects of sound quality are transformed. When the cable is provided terminated, this reduction in the number of strands has already been done. The insulation of the Cable is quite easy to cut with a sharp blade, rather like hard cheese, and full guidance is either given at point of sale or, perhaps where the sale is not direct through Ringmat Developments, subsequently on request. The terminated strands at the end of each conductor should not be soldered to any connector or plug. Use of solder not only destroys the benefit of removing the 7 strands, it also limits the overall performance of the cable. Where the speaker terminal sockets are sufficiently substantial to take the paired conductors, it is obviously better to connect in this way rather than use connector plugs. However, the thickness of the paired conductors of the Pure Power Cable is often too great for direct insertion into most speaker cable sockets. It is then necessary to use plug connectors to clamp onto the bare wire cores and for the pins of the connectors to be inserted into the speaker cable sockets. The design of the plug connectors used with the Pure Power Cable is very important, which is why we have chosen to use either our selected UK made 4mm stackable banana plugs or the WBT Insulated 4mm banana plugs (also stackable) or 8mm spades when the Cable is provided terminated. All other plugs we have tried have degraded the sound. 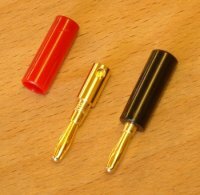 Our selected UK made 4mm stackable banana plugs are not insulated, therefore it is important to ensure at all times that they do not touch one another or other conductive objects whilst connected to an amplifier which has not settled after being turned off, or has not been muted in accordance with the manufacturer’s instructions. Terminal plates - ugh! It has become the practice of some speaker manufacturers to provide pretty gold coloured plates to connect same polarity speaker sockets where making provision for the single wiring of bi or tri-wirable speakers. These plates destroy the sound and should be replaced with speaker wire similar to that used for carrying the signal from the amplifier to the speaker (assuming this cable is found to be satisfactory). Whilst this is a general point, in practice we would expect our Pure Power Speaker Cable to be used! In general, it is usual to connect the positive (red) conductors/connectors to the red speaker cable sockets at both ends and the negative (black) conductors/connectors to the black speaker cable sockets. However, there are two reasons why this may not be the best way. 1. Some speakers have certain of their drive units out of absolute phase to the other drive units. We find this arrangement damages the sound, and so where separate terminal sockets are provided at the rear of the speakers for each drive unit, it may be desirable, in respect of those drive units out of polarity with the others, to reverse the connections. In such cases, connect the positive (red) conductors/connectors to the black speaker cable sockets at the speaker end and the negative (black) conductors/connectors to the red speaker cable sockets. Treat both speakers the same. you know which is the correct absolute phase to use? The only way to find out is to listen, both with and without the absolute phase being inverted. Stick with that which is the more musical and where the detail of the image is the most defined and focused. We have interesting developments to report on this subject, which we shall publish in due course. When our Remote Controlled Absolute Phase Inverter is available, this will make the whole business much easier with the sound on a very much higher plane. Remember, when listening after a change of cables or of any equipment, allow some time before the transfer of the signal, and therefore the sound, settles down. It should start to improve after half an hour and will be better after two hours, but will improve still further after a few days. The same applies each time the system is switched on, though the time taken will usually be less when no changes have been made, depending upon how long the equipment has been left turned off. Another aspect affecting the sound when changing cables or equipment is the change in the ‘loading’ of the system. Not enough is yet known about this ‘loading’ factor, but it appears to have a great deal to do with the timing of the signal and the timing of sound reflections. Inevitably, this affects the timing of the music, which can suddenly seem to go flat after a change in the system. These tiny changes in the timing of sound reflections can also give rise to what might otherwise be thought to be distortion, and can be found throughout the frequency range. It is, however, possible to accommodate most of these changes in timing by adjusting the distance the speakers are placed from the rear wall and the extent to which the speakers are ‘toed-in’.